Some despicable humans throw animals away like they’re trash, but even these abandoned animals know better than to do something like that. A formerly homeless dog not only found six kittens in a trash heap, but he painstakingly carried them home. Banzé, or Scamp, heard the cries of the kittens coming from a box on a trash pile in a neighborhood in São Paulo, Brazil. He gingerly tore the box apart, and like a true mother, carried them one by one to his new home. As a dog that once fended for himself on the streets, Banzé knew how it felt to have no one care about him. He paid forward the good deed of his owner’s adoption of him, and saved those kittens from what might have been a slow and agonizing death. This story was first reported in 2012, but Life With Dogs hadn’t caught it, and found that a story like this is always worth sharing, no matter how old! Sweetest dog ever. I am crying at my desk right now. What a world we live in. Animals have more compassion that humans do. 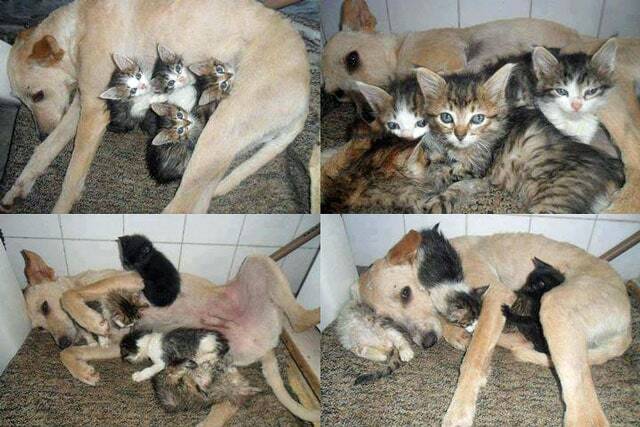 What an awesome dog, she deserves so much for being so caring, unlike the humans who threw away these adorable kittens. Goes to show that animals can have feelings for one another, even when they are truly opposites. Animals have more compassion because they are still innocent and haven’t been corrupted by sin as humans have. We truly live in a fallen world, but thankfully there are stories like this to lift our spirits a bit! Bless sweet Scamp! That was such a goooodddddd Boyyyyy! Dogs can be more human than…..well, humans. a dingo stole my babies!” ) People are soooo quick to judge. It amazes me that many comments imply all humans would not do this wonderful act of kindness. I know lots of people, including myself, that would have done this. I have also seen dogs attack and eat a baby kitten. So, please don’t label humans (or dogs) by this one story. I have rescued a lot of cats including some kittens left in my recycle bin. I found a home for everyone of them. I had 7 cats at the time so I thought it would be best to find them a good home. I would do it again to. I know plenty of people who would do the same thing. Are there any updates on this story? What has happened to the kittens and where is the dog? Ahhh! This is such a beautiful pup with those kitties! What love and true caring! Instinctively that wonderful dog carried those kittens home to rescue. . . xoxo Thank you for sharing this amazing story. And yes, that would be so awesome to find some kind of followup on these friends, as they found each other a year ago! Thank you again for sharing this lovely story of hope!! That first picture. COME ON! Seriously. COME ON! Aah. So sweet! That is love! What a wonderful dog! Would love to know how he and the kittens are doing now – are they all in loving homes? I really hope they are! Can we get an update? Dog’manity is higher and transcends hu’manity. Some people do not care about them. This often happens when the people are not able to take care or do not have time to take care of these innocent animals. I just hate it when someone hits or throws them. I learnt a leason in my school that “If we give a little love also to the animals, they will give us lot more than us.